Things to consider BEFORE you upgrade to Windows 10. Will all of your hardware work with it. Will all of your software work with it. PC Colorado can sign on to your computer remotely so we can see what problems you are experiencing. This can save you money and time since we can instantly sign on to your computer and see what the problem is. The means you do not have to wait for an on-site service call plus the cost is just a fraction of what it would cost to have us come out. © Copyright,2017. All Rights Reserved. 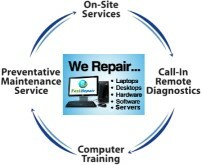 PC Colorado's services include computer and server sales, installation, maintenance and repair. We also can install cabling, provide phone/remote support , software and hardware sales, in-shop repairs, and on-site service calls. We can help get your computer, server or network up and running quickly. Professional home and business service for laptops, desktops, servers, networks, software, and hardware. Our customers can be found in most areas of businesses including doctors, dentists, attorneys, retailers, recyclers, manufacturers, business services and realtors.